Claire of The Kitchy Kitchen and Laurel of Sweet Laurel truly outdid themselves when they added these show-stopping desserts to our Friendsgiving brunch menu. Laurel whipped up two grain-free, gluten-free vegan, and dairy dishes: Pecan Pullaway Pie and Pumpkin Spice Caramel Cake. These are a great health-conscious way to indulge this time of year. 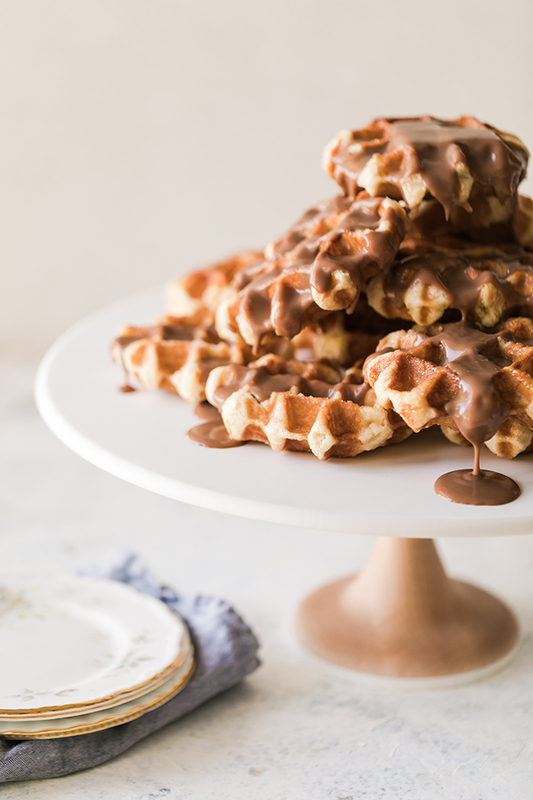 And for those of you who tend to go for the real deal when it comes to treats, Claire is sharing crispy liege waffles with warm milk chocolate sauce. We know what our favorite dessert of the day was, but we’ll leave it up to you to pick yours… Enjoy! 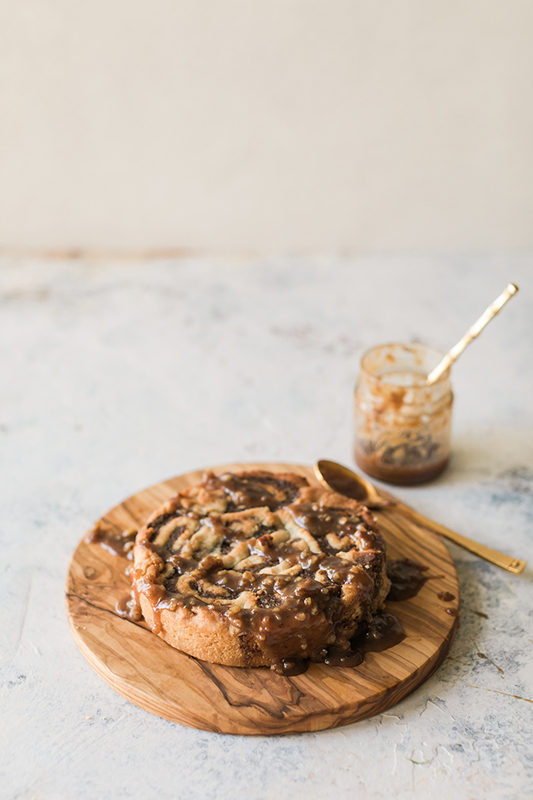 **This recipe is grain free, gluten free, vegan, dairy free and paleo! 1. To make the dough, begin by preheating oven to 350. Put coconut butter and coconut oil in a small bowl and place in freezer for about 5 minutes. Place almond flour, baking powder and pink salt in bowl, stir together. Add chilled coconut butter and coconut oil to bowl, and using pastry blenders, cut coconut butter and oil into batter. 2. Roll dough out, about 3 inches thick, between two layers of parchment paper into a rectangular shape. Set in fridge while you prepare filling. 3. 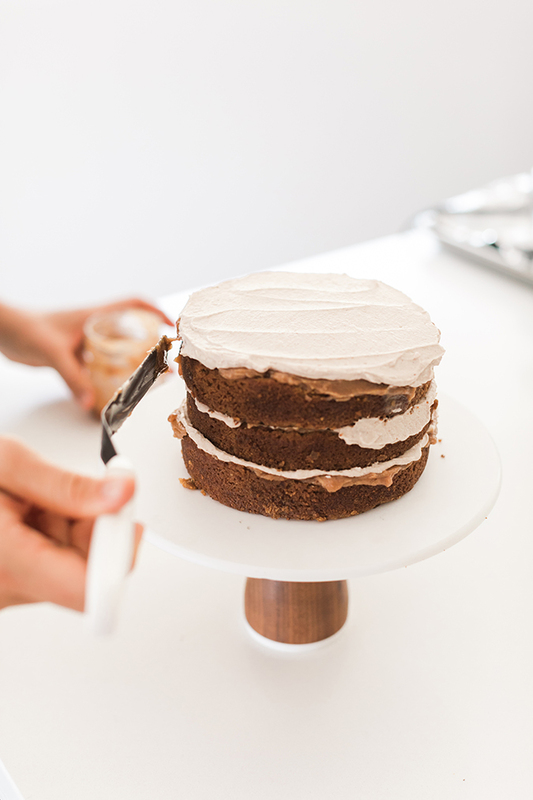 Prepare a 6 inch cake tin by greasing with coconut oil. 4. To prepare filling, combine all ingredients, excepts for pecans in food processor or blender. Remove mixture from blender and stir in pecans. Pour mixture over rolled out crust. Carefully roll dough into a log, like you would for pinwheel cookies. Cut 1-2 inch rounds of dough and place in the base of greased cake tin. 5. Bake for about 15 minutes, until golden and rolls are baked through. Remove from oven and allow to cool completely. 7. Pour coconut milk and maple syrup in a saucepan. Simmer over low heat about 20 -30 minutes, until thick. Slowly stir in pecans. Before serving, pour over pecan pull away cake. Note: This recipe is grain free, gluten free, vegan, dairy free and paleo! 1. Preheat the oven to 350°F. Line three 6 inch cake pans or two 8 inch pans with parchment paper rounds, then grease the sides with coconut oil. 2. Whisk together the pumpkin, maple syrup, oil, and vanilla in a large bowl. Then whisk in eggs. In another bowl, combine the flour, spices, baking soda and salt. A little at a time, add the flour mixture to the wet ingredients, stirring until a batter forms. 3. Divide the batter between the cake pans. Bake for about 30 minutes, or until a toothpick comes out cleanly. Remove the cakes from the pan, and allow to cool completely on a rack. 4. 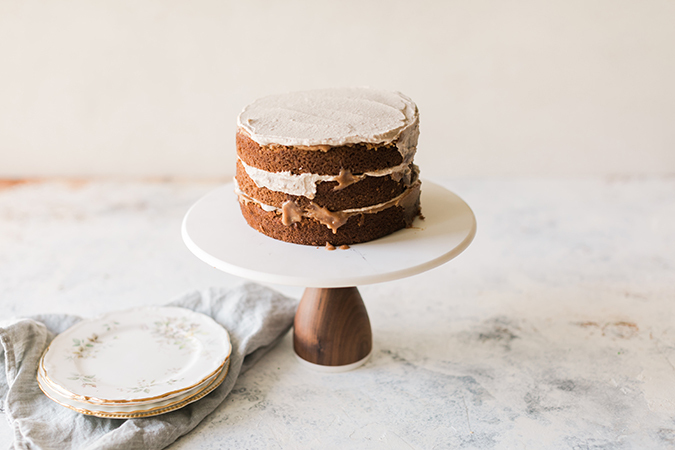 To build the cake, place one cooled cake round on cake plate. 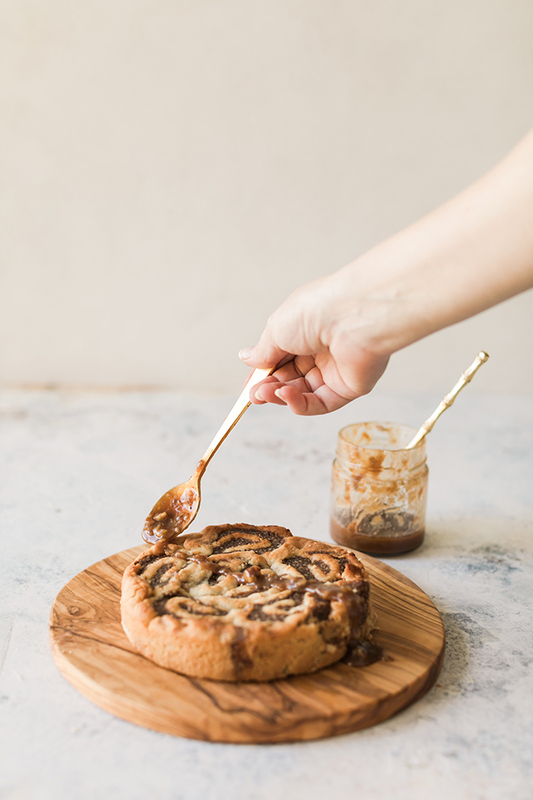 Top with 1-2 tablespoons vegan caramel and spread evenly over 1st Dollop 2 tablespoons chai coconut whipped cream over caramel, then repeat with second cake layer. Repeat with all three cake layers. Refrigerate until serving and enjoy! 1. Set the can of coconut milk in the coldest part of the fridge overnight so that the coconut fat solids separate from the coconut water. 2. Open the can and carefully scoop out the thick coconut cream. 3. With an electric whisk, beat the cream, maple syrup, cinnamon, ginger, cloves and cardamom. Note: This recipe contains dairy and gluten. 1. Warm milk to lukewarm, or between 110 and 116 degrees F, and place in the bottom of a large mixer bowl. Add sugar and yeast and stir to combine. Set aside for 5 minutes; the yeast should look foamy. 2. Whisk in eggs and vanilla, then stir in about 2 cups of the flour. Add the salt and mix to combine. Using the dough hook of a stand mixer, add the butter, a spoonful at a time, thoroughly kneading in each addition and scraping down the bowl as needed before adding the next until all of the butter has been mixed in. This takes a while, but it’s what makes the waffles so delicious and rich. Add remaining flour and knead with dough hook on low speed for 5 minutes, or until glossy. 4. Cover bowl with plastic warp and leave in the fridge overnight, or up to 24 hours. 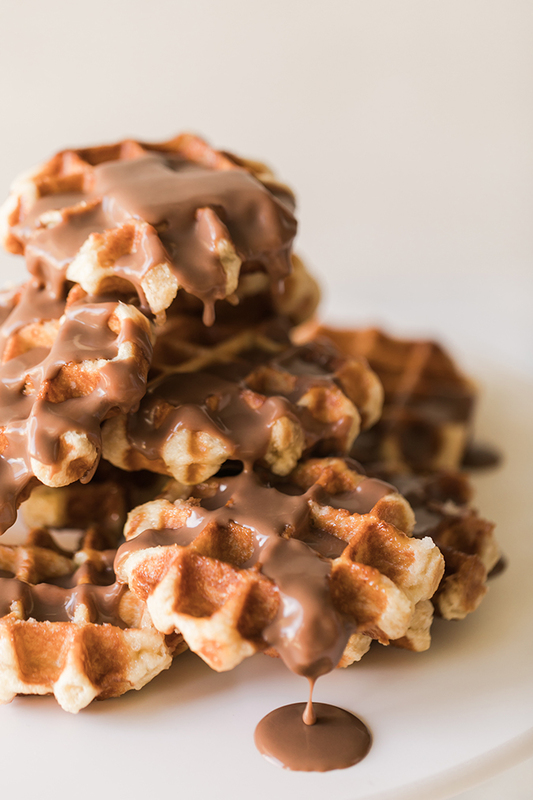 When you make the waffles, bring the dough back to room temperature for 60 minutes, stir to deflate, and let rise again for another 1 1/2 to 2 hours. 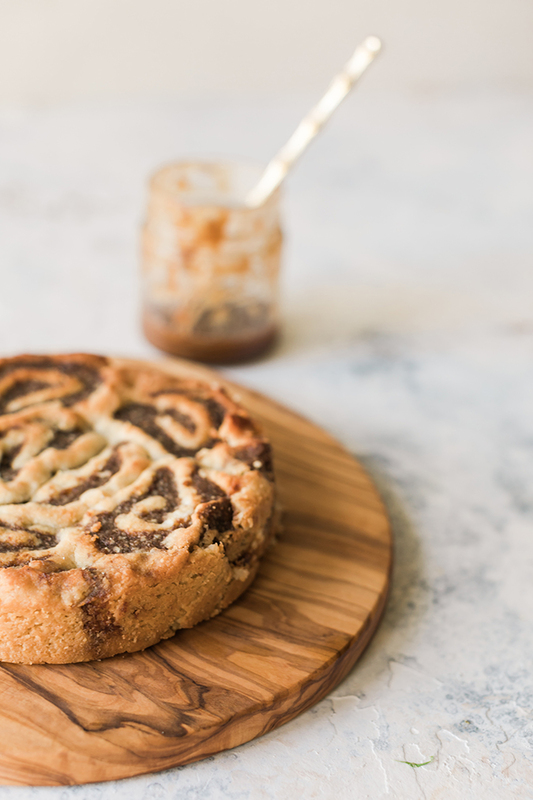 Knead in the pearl sugar – don’t worry, it looks like way too much, but it’s perfect! Divide the dough into 16 mounds. The dough should be silken and barely cool, if they’re warm or greasy just pop back in the fridge for 15 minutes. 5. 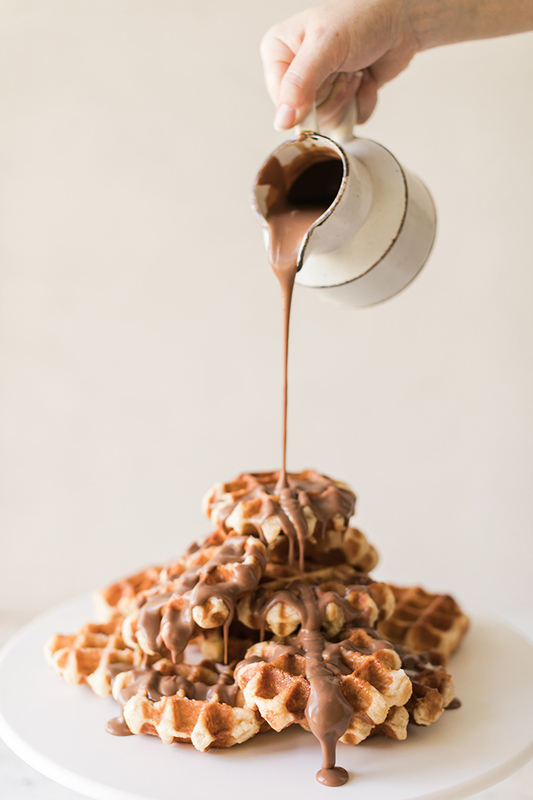 Heat your waffle iron (Belgian style is best) over medium heat. Place first ball of waffle dough on grid and cook according to waffle maker’s instructions. Cook until deeply golden all over, which will take approximately 5 minutes, then carefully transfer with tongs or a fork to a cooling rack. Careful, the sugar makes them super hot! Repeat with remaining balls of dough, adjusting temperature of waffle iron as needed to get the color you want. Serve warm (you can rewarm in a low oven). 1. Place chocolate and salt in a medium heatproof bowl. Heat cream in a small saucepan just until steaming (do not bring to a boil) and pour over chocolate. Let sit until chocolate is melted, about 5 minutes. 2. Add butter and whisk until butter is melted and incorporated and mixture is smooth. Serve warm. Thanks to Claire and Laurel for sharing these beautiful and delicious treats! What is your favorite dish to bake this time of year? Do you have any go-to Thanksgiving desserts you always make? Share your two cents in the comments below! And check back on the site next week for our last installment of our Friendsgiving Brunch series: the cocktails.